Wrong date: 29 October 2009, although the application update was released on 16 March 2011. 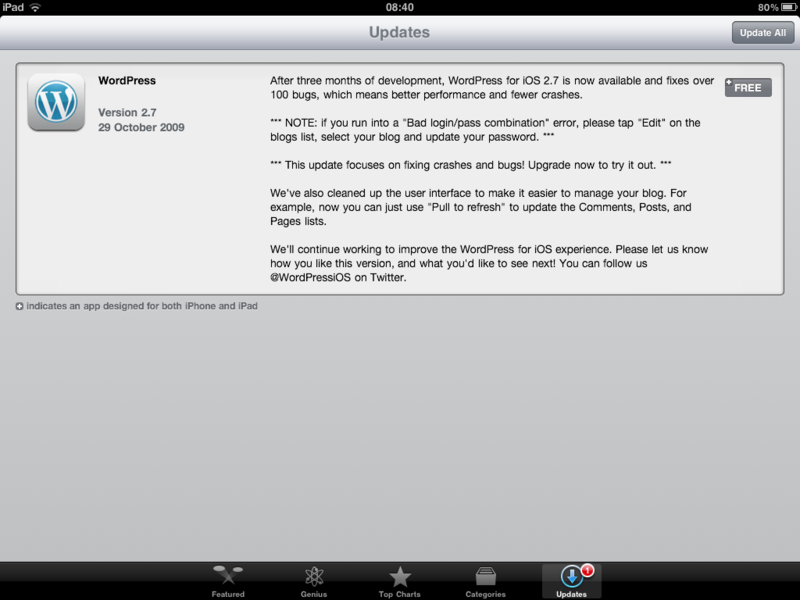 Update: The issue is still not fixed in iOS 4.3.1, at least on my iPad. Categories: Apple. 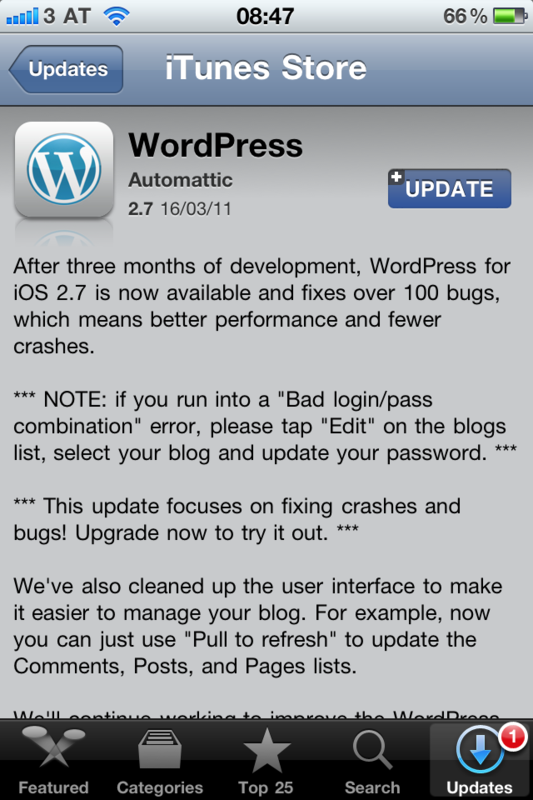 Tags: app store, Apple, bug, date, ios, update. If you do not have the otool command, make sure Xcode is properly installed. Posted by Cristian Bradiceanu at 11:32 am on March 4th, 2011. Categories: Apple. Tags: ldd, otool. Just upgraded my Mac mini I use as a media center to find out that the new Front Row does not stream to remote AirTunes speakers as it did in Mac OS X 10.4 Tiger. Front Row sound goes only to audio out, which is connected to the TV. One more thing: the music stops when leaving the Music menu in Front Row. Mac OS X 10.5.1 update does not fix these problems. Apple Support Discussions thread is here. Posted by admin at 10:52 am on November 23rd, 2007. Categories: Apple. Tags: 10.5, AirTunes, Apple, Front Row, leopard, mac os x. “YouTube not available” error message is shown on the iPod touch display when a proxy server is configured. I see a 404 error message for http://iphone-wu.apple.com/feeds/standardfeeds/ in squid logs. Same problem reported on Apple Discussions. Posted by admin at 5:01 pm on November 10th, 2007. Categories: Apple, Internet. Tags: iPod touch, proxy, YouTube. Apple has just released Mac OS X 10.4.10. FireWire (OHCI) Lucent ID 5811 PCI now active, GUID 0019e3fffe17e748; max speed s400. Posted by admin at 11:30 pm on June 21st, 2007. I signed up with rsync.net for an off-site filesystem. Opted for geo-redundant version (automated nightly replication to other site) located in Zurich, Switzerland. Very fast speed from Europe and Qatar, good speed with US hosts. Very easy to use from Mac OS X, FreeBSD, Linux and Windows (rsync, ftp, scp, sftp, ssh, WebDAV). Direct integration in Finder, just use “Connect to Server” and enter the hostname address with https. On Linux and FreeBSD 6.x sshfs works like a charm. Easy to install on FreeBSD using ports, just cd /usr/ports/sysutils/fusefs-sshfs and run make install clean. Posted by admin at 11:11 am on June 16th, 2007. Categories: Apple, FreeBSD, Internet, Linux. Posted by admin at 11:00 pm on May 14th, 2007. Just upgraded to Xcode Tools 2.4. Posted by admin at 2:07 am on August 10th, 2006. Posted by admin at 9:02 pm on July 7th, 2006. Posted by admin at 8:55 pm on July 7th, 2006.